Chiune Sugihara (杉原 千畝, Sugihara Chiune, 1 January 1900 – 31 July 1986) was a Japanese government official who served as vice consul for the Japanese Empire in Kaunas, Lithuania. During the Second World War, Sugihara helped some six thousand Jews flee Europe by issuing transit visas to them so that they could travel through Japanese territory, risking his job and his family's lives. The fleeing Jews were refugees from German-occupied Western Poland and Soviet-occupied Eastern Poland, as well as residents of Lithuania. A few decades after the war, in 1985, the State of Israel honored Sugihara as one of the Righteous Among the Nations (Hebrew: חסידי אומות העולם) for his actions. He is the only Japanese national to have been so honored. Sugihara told the refugees to call him "Sempo" – the Sino-Japanese reading of the Japanese characters of his given name – as it was easier for non-Japanese persons to pronounce. Chiune Sugihara was born on 1 January 1900 (Meiji 33),in the Kitayama district of the village of Yaotsu (八百津), Gifu prefecture, to a middle-class father, Yoshimi Sugihara (杉原好水 Sugihara Yoshimi), and an upper-middle class mother, Yatsu Sugihara (杉原やつ Sugihara Yatsu). When he was born, his father worked at a tax office in Kozuchi-town and his family lived in a borrowed temple, with the Buddhist temple Kyōsen-ji (教泉寺) where he was born nearby. He was the second son among five boys and one girl. His father and family moved into the tax office within the branch of the Nagoya Tax Administration Office one after another. In 1903 (Meiji 36) his family moved to Asahi Village in Niu-gun, Fukui Prefecture. In 1904 (Meiji 37) they moved to Yokkaichi city Mie Prefecture. On 25 October 1905 (Meiji 38), they moved to Nakatsu Town, Ena-gun, Gifu Prefecture. In 1906 (Meiji 39) on 2 April, Chiune entered Nakatsu Town Municipal Elementary School (now Nakatsugawa City Minami Elementary School in Gifu Prefecture). On 31 March 1907 (Meiji 40), he transferred to Kuwana Municipal Kuwana Elementary School in Mie Prefecture (currently Kuwana Municipal Nissin Elementary School). In December of that same year, he transferred to Nagoya Municipal Furuwatari Elementary School (now Nagoya Municipal Heiwa Elementary School). In 1912, he graduated with top honors from Furuwatari Elementary School and entered Aichi prefectural 5th secondary school (now Zuiryo high school), a combined junior and senior high school. His father wanted him to become a physician, but Chiune deliberately failed the entrance exam by writing only his name on the exam papers. Instead, he entered Waseda University in 1918 (Taishō 7) and majored in English language. At that time, he entered Yuai Gakusha, the Christian fraternity that had been founded by Baptist pastor Harry Baxter Benninhof, to improve his English. In 1919 (Taishō 8), he passed the Foreign Ministry Scholarship exam. From 1920 to 1922 (Taishō 9 to 11), Sugihara served in the Imperial Army as a second lieutenant with the 79th Infantry, stationed in Korea, then a Japanese colony. He resigned his commission in November 1922 and took the Foreign Ministry's language qualifying exams the following year, passing the Russian exam with distinction. The Japanese Foreign Ministry recruited him and assigned him to Harbin, China, where he also studied the Russian and German languages and later became an expert on Russian affairs. Chiune Sugihara's birth Registry, indicating his birthplace as Kozuchi Town, Mugi District, nowadays known as Mino City in Gifu Prefecture. Observation Kozuchi-town from Mt.Ogura . Kyosenji Temple where Chiuna Sugihara was born and village section Named "Chiune" which can be seen from the temple. Kyōsen-ji Temple (教泉寺). This temple was located at the address reported as the birthplace of Sugihara Chiune, and there was a Kōzuchi tax office that Chiune father served in the immediate area. Chiune Bridge. A bridge over Chiune-cho which was the origin of the name of Chiune. When Sugihara served in the Manchurian Foreign Office, he took part in the negotiations with the Soviet Union concerning the Northern Manchurian Railroad. During his time in Harbin, Sugihara married Klaudia Semionovna Apollonova and converted to Christianity (Russian Orthodox Church) for the wedding, using the baptismal name Sergei Pavelovich. In 1935, Sugihara quit his post as Deputy Foreign Minister in Manchuria in protest over Japanese mistreatment of the local Chinese. Sugihara and his wife divorced in 1935, before he returned to Japan, where he married Yukiko Kikuchi, who became Yukiko Sugihara (杉原 幸子 Sugihara Yukiko; 1913–8 October 2008) after the marriage; they had four sons (Hiroki, Chiaki, Haruki, Nobuki). As of 2010, Nobuki is their only surviving son and represents the Chiune Sugihara family. 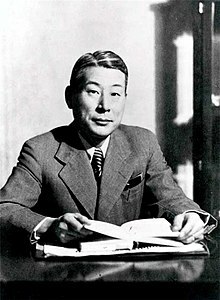 Chiune Sugihara also served in the Information Department of the Ministry of Foreign Affairs and as a translator for the Japanese delegation in Helsinki, Finland. Former Japanese consulate in Kaunas. In 1939, Sugihara became a vice-consul of the Japanese Consulate in Kaunas, Lithuania. His duties included reporting on Soviet and German troop movements, and to find out if Germany planned an attack on the Soviets and, if so, to report the details of this attack to his superiors in Berlin and Tokyo. Sugihara had cooperated with Polish intelligence as part of a bigger Japanese–Polish cooperative plan. As the Soviet Union occupied sovereign Lithuania in 1940, many Jewish refugees from Poland (Polish Jews) as well as Lithuanian Jews tried to acquire exit visas. Without the visas, it was dangerous to travel, yet it was impossible to find countries willing to issue them. Hundreds of refugees came to the Japanese consulate in Kaunas, trying to get a visa to Japan. At the time, on the brink of the war, Lithuanian Jews made up one third of Lithuania's urban population and half of the residents of every town[clarification needed] as well. In the period 16 July - 3 August 1940 the Dutch Honorary Consul Jan Zwartendijk provided over 2,200 Jews with an official third destination to Curaçao, a Caribbean island and Dutch colony that required no entry visa, or Surinam (which, upon independence in 1975, became Suriname). At the time, the Japanese government required that visas be issued only to those who had gone through appropriate immigration procedures and had enough funds. Most of the refugees did not fulfill these criteria. Sugihara dutifully contacted the Japanese Foreign Ministry three times for instructions. Each time, the Ministry responded that anybody granted a visa should have a visa to a third destination to exit Japan, with no exceptions. From 18 July to 28 August 1940, aware that applicants were in danger if they stayed behind, Sugihara decided to ignore his orders and issued ten-day visas to Jews for transit through Japan. Given his inferior post and the culture of the Japanese Foreign Service bureaucracy, this was an unusual act of disobedience. He spoke to Soviet officials who agreed to let the Jews travel through the country via the Trans-Siberian Railway at five times the standard ticket price. Sugihara continued to hand-write visas, reportedly spending 18–20 hours a day on them, producing a normal month's worth of visas each day, until 4 September, when he had to leave his post before the consulate was closed. By that time he had granted thousands of visas to Jews, many of whom were heads of households and thus permitted to take their families with them. Before he left, he handed the official consulate stamp to a refugee so that more visas could be forged. According to witnesses, he was still writing visas while in transit from his hotel and after boarding the train at the Kaunas Railway Station, throwing visas into the crowd of desperate refugees out of the train's window even as the train pulled out. In final desperation, blank sheets of paper with only the consulate seal and his signature (that could be later written over into a visa) were hurriedly prepared and flung out from the train. As he prepared to depart, he said, "Please forgive me. I cannot write anymore. I wish you the best." When he bowed deeply to the people before him, someone exclaimed, "Sugihara. We'll never forget you. I'll surely see you again!" Sugihara himself wondered about official reaction to the thousands of visas he issued. Many years later, he recalled, "No one ever said anything about it. I remember thinking that they probably didn't realize how many I actually issued." European Jewish refugees began to arrive in Japan from July 1940 and departed by September 1941. An overview during this period is described in the Annual Report of 1940 and 1941 by the American Jewish Joint Distribution Committee (JDC). In June 1940, Italy entered into the war and the Mediterranean route was closed. "The Committee in Great Germany, forced to seek new outlets for emigration, arranged for the transportation of Jews from Germany across Europe and Asia (via the trans-Siberian railway) to Vladivostok, thence to Japan. From Japan the refugees were to embark for countries in the Western Hemisphere”. “On December 31, 1940, Soviet Union declared giving all persons residing in Lithuania on September 1, 1940 the right to apply for Soviet citizenship. While the great bulk of Polish refugees in Lithuania opted for Soviet citizenship, there was a group of 4,000-5,000 persons for whom the New Order offered little opportunity. These were principally rabbis, yeshiva students, members of the intellectual classes and leaders of various Jewish communal and labor organizations. They immediately applied for exit permits from Lithuania. 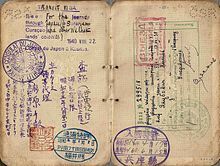 Although during the early weeks of 1941 exit permits and Japanese transit visas were readily granted, the problem was how to find transportation costs for those people whose very existences were jeopardized if they remained in Lithuania. The JDC in collaboration with a number of other American Jewish groups, contributed toward the funds required for the trans-Siberian trip to Japan of 1,700 persons”. In July 1940, Jewish refugees in Germany and other countries began arriving at Tsuruga, Shimonoseki and Kobe. Japanese embassies and consulates except Kaunas issued 3,448 Japanese transit visas from January of 1940 to mid-March of 1941. Most of them held valid end-visas and immediately departed Japan. From October of 1940, Polish refugees from Lithuania began to land on Tsuruga. Their number increased sharply from January of 1941.“By the end of March there were close to 2,000 in the country, mostly in Kobe. More than half of these refugees did not hold valid end-visas and were unable to proceed further than Japan”. They were forced to stay for a long time to find the immigration countries. The number of Jewish refugees who came to Japan, as shown in Table 1, has documents with 4,500, 5,000 or 6,000. 552 persons of the second row of the table, are not reliable because Siberian railway has been closed, does not match the table of departing persons edited by Jewcom, there is no supporting diplomatic documents. For 200 persons described in note 1 of Table 1, there is a document in Archives of MOFA that the Japanese consulate of Vladivostok transferred about 50 Polish Jews who had stranded in Vladivostok to Shanghai with Soviet Union cargo on April 26, 1941. Concerning the number of refugees passing through Japan who held Japanese transit visas for Curacao issued by Sugihara (so-called “Sugihara visa”), there are two documents saying 2,200 and 6,000. 6,000 persons written in "Visas for Life" was a hearsay. K.Watanabe argued that there could be 6,000 for the reason that to use by three families per visa is reasonable, that there were newspaper articles with 6,000, and that most of the refugees were now admitted to have Sugihara visa. On September 29, 1983, Fuji Television aired "One visa that divided the fate-the Japanese who saved 4,500 Jews". In 1985 when Chiune Sugihara received “Righteous among the Nations”, some Japanese newspapers reported that he saved 6,000 persons and others 4,500. Japanese newspapers reported only the number of refugees in total, not by nationality. Table 2 shows the number of refugees who had stayed at Kobe in 1941 based on Archives of MOFA. Refugees classified as "No visa" in table, are presumed to have held counterfeit Japanese transit visas issued by Sugihara. The Soviet wanted to purge Polish refugees who had stranded in Soviet territory with Japanese transit visas as soon as possible, so permitted them to get on the train to Vladivostok with or without a destination visa. Japanese government was forced to admit the entry of them. On April 8, 1941, of the 1,400 Polish Jews, "for Curacao" and "No visa" were about 1,300. More than half of the refugees who entered with invalid visas including "Sugihara visa" obtained valid visas with the help of JDC, Jewcom and the Embassy of Poland, and embarked host countries. In August - September 1941, Japanese authorities transferred about 850 refugees stranded in Japan to Shanghai before Japan and the United States began war. According to Emigration Table by Jewcom, the number of Polish refugees leaving Japan was Shanghai 860, USA 532, Canada 186, Palestine 186, Australia 81, South Africa 59, and others 207 in total 2,111. The total number of Jews saved by Sugihara is in dispute, estimating about 6,000; family visas—which allowed several people to travel on one visa—were also issued, which would account for the much higher figure. The Simon Wiesenthal Center has estimated that Chiune Sugihara issued transit visas for about 6,000 Jews and that around 40,000 descendants of the Jewish refugees are alive today because of his actions. Polish intelligence produced some false visas. Sugihara's widow and eldest son estimate that he saved 10,000 Jews from certain death, whereas Boston University professor and author, Hillel Levine, also estimates that he helped "as many as 10,000 people", but that far fewer people ultimately survived. Indeed, some Jews who received Sugihara's visas failed to leave Lithuania in time, were later captured by the Germans who invaded the Soviet Union on 22 June 1941, and perished in the Holocaust. The Diplomatic Record Office of the Ministry of Foreign Affairs has opened to the public two documents concerning Sugihara's file: the first aforementioned document is a 5 February 1941 diplomatic note from Chiune Sugihara to Japan's then Foreign Minister Yōsuke Matsuoka in which Sugihara stated he issued 1,500 out of 2,139 transit visas to Jews and Poles; however, since most of the 2,139 people were not Jewish, this would imply that most of the visas were given to Polish Jews instead. Levine then notes that another document from the same foreign office file "indicates an additional 3,448 visas were issued in Kaunas for a total of 5,580 visas" which were likely given to Jews desperate to flee Lithuania for safety in Japan or Japanese occupied-China. Many refugees used their visas to travel across the Soviet Union to Vladivostok and then by boat to Kobe, Japan, where there was a Jewish community. Tadeusz Romer, the Polish ambassador in Tokyo, organized help for them. From August 1940 to November 1941, he had managed to get transit visas in Japan, asylum visas to Canada, Australia, New Zealand, Burma, immigration certificates to the British Mandate of Palestine, and immigrant visas to the United States and some Latin American countries for more than two thousand Polish-Lithuanian Jewish refugees, who arrived in Kobe, Japan, and the Shanghai Ghetto, China. The remaining number of Sugihara survivors stayed in Japan until they were deported to Japanese-held Shanghai, where there was already a large Jewish community that had existed as early as the mid-1930s. Some took the route through Korea directly to Shanghai without passing through Japan. A group of thirty people, all possessing a visa of "Jakub Goldberg", were bounced back and forth on the open sea for several weeks before finally being allowed to pass through Tsuruga. Most of the around 20,000 Jews survived the Holocaust in the Shanghai ghetto until the Japanese surrender in 1945, three to four months following the collapse of the Third Reich itself. Sugihara was reassigned to Königsberg, East Prussia[page needed] before serving as a Consul General in Prague, Czechoslovakia, from March 1941 to late 1942 and in the legation in Bucharest, Romania from 1942 to 1944. He was promoted to the rank of third secretary in 1943, and was decorated with the Order of the Sacred Treasure, 5th Class, in 1944. When Soviet troops entered Romania, they imprisoned Sugihara and his family in a POW camp for eighteen months. They were released in 1946 and returned to Japan through the Soviet Union via the Trans-Siberian railroad and Nakhodka port. In 1947, the Japanese foreign office asked him to resign, nominally due to downsizing. Some sources, including his wife Yukiko Sugihara, have said that the Foreign Ministry told Sugihara he was dismissed because of "that incident" in Lithuania. Sugihara settled in Fujisawa in Kanagawa prefecture with his wife and three sons. To support his family he took a series of menial jobs, at one point selling light bulbs door to door. He suffered a personal tragedy in 1947 when his youngest son, Haruki, died at the age of seven, shortly after their return to Japan. In 1949 they had one more son, Nobuki, who is the last son alive representing the Chiune Sugihara Family, residing in Belgium. He later began to work for an export company as general manager of U.S. Military Post Exchange. Utilizing his command of the Russian language, Sugihara went on to work and live a low-key existence in the Soviet Union for sixteen years, while his family stayed in Japan. In 1968, Yehoshua (alternatively spelled Jehoshua or Joshua) Nishri, an economic attaché to the Israeli Embassy in Tokyo and one of the Sugihara beneficiaries, finally located and contacted him. Nishri had been a Polish teen in the 1940s. The next year Sugihara visited Israel and was greeted by the Israeli government. Sugihara beneficiaries began to lobby for his recognition by Yad Vashem. In 1984, Yad Vashem recognised him as Righteous Among the Nations (Hebrew: חסידי אומות העולם‎, translit. Khasidei Umot ha-Olam). Sugihara was too ill to travel to Israel, so his wife and youngest son Nobuki accepted the honor on his behalf. In 1985, 45 years after the Soviet invasion of Lithuania, he was asked his reasons for issuing visas to the Jews. Sugihara explained that the refugees were human beings, and that they simply needed help. You want to know about my motivation, don't you? Well. It is the kind of sentiments anyone would have when he actually sees refugees face to face, begging with tears in their eyes. He just cannot help but sympathize with them. Among the refugees were the elderly and women. They were so desperate that they went so far as to kiss my shoes, Yes, I actually witnessed such scenes with my own eyes. Also, I felt at that time, that the Japanese government did not have any uniform opinion in Tokyo. Some Japanese military leaders were just scared because of the pressure from the Nazis; while other officials in the Home Ministry were simply ambivalent. People in Tokyo were not united. I felt it silly to deal with them. So, I made up my mind not to wait for their reply. I knew that somebody would surely complain about me in the future. But, I myself thought this would be the right thing to do. There is nothing wrong in saving many people's lives...The spirit of humanity, philanthropy...neighborly friendship...with this spirit, I ventured to do what I did, confronting this most difficult situation—and because of this reason, I went ahead with redoubled courage. When asked by Moshe Zupnik why he risked his career to save other people, he said simply : "I do it just because I have pity on the people. They want to get out so I let them have the visas." Sugihara died the following year at a hospital in Kamakura, on 31 July 1986. In spite of the publicity given him in Israel and other nations, he remained virtually unknown in his home country. Only when a large Jewish delegation from around the world, including the Israeli ambassador to Japan, attended his funeral, did his neighbors find out what he had done. He may have lost his diplomatic career but he received much posthumous acclaim. Wife. Poet and author of "Visas for 6,000 Lives". Eldest daughter of high school principal in Kagawa Prefecture, granddaughter of Buddhist priest in Iwate Prefecture. Well versed in German. Member of Kanagawa Prefecture Poetry Committee and Selection Committee for Asahi Shimbun's Kadan poetry section. Author of Poetry Anthology: White Nights and other. Eldest son. Studied in California upon graduating from Shonan High School in Kanagawa Prefecture in Japan. Translated his mother's book "Visas for Life" into English. Second son. Born in Helsinki. Studied in California. Third son. He was born in Kaunas. Died at the age of 7 of leukemia. Fourth son. Attended Hebrew University in Israel in 1968 at the invitation of the Israeli Foreign Ministry and the Jewish Fund. Represents the Sugihara family as the only surviving son of Chiune. Since his attendance at the award ceremony of the Sugihara Righteous Forest in the outskirt of Jerusalem on behalf of Chiune in 1985, Nobuki has been actively attending Chiune-related events around the world as the family's spokesperson. Nobuki also heads NPO Sugihara, registered in Belgium, in order to promote peace in the Middle East. Grandchildren: Chiune Sugihara has 9 grandchildren (8 still alive) and 7 great-grandchildren. Port of Humanity Tsuruga Museum in Tsuruga, Fukui, Japan contains a Sugihara Chiune Corner. Sugihara Street in Vilnius, Lithuania, Chiune (Sempo) Sugihara Street in Jaffa, Israel, and the asteroid 25893 Sugihara are named after him. In 1992, the town of Yaotsu opened the Park of Humanity, on a hill over looking the town. In 2000, the Sugihara Chiune Memorial Hall was opened to the public. Since its establishment, more than 600,000 visitors, Japanese and foreign, visited and studied about Sugihara and his virtue. A corner for Sugihara Chiune is set up in the Port of Humanity Tsuruga Museum near Tsuruga Port, the place where many Jewish refugees arrived in Japan, in the city of Tsuruga, Fukui, Japan. 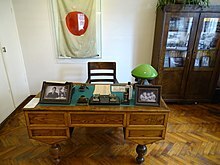 The Sugihara House Museum is in Kaunas, Lithuania. The Conservative synagogue Temple Emeth, in Chestnut Hill, Massachusetts, USA, built a "Sugihara Memorial Garden" and holds an Annual Sugihara Memorial Concert. When Sugihara's widow Yukiko traveled to Jerusalem in 1998, she was met by tearful survivors who showed her the yellowing visas that her husband had signed. A park in Jerusalem is named after him. The Japanese government honored him on the 2000 centennial of his birth. In the US, a memorial to Sugihara was built in Los Angeles' Little Tokyo in 2002, and dedicated with consuls from Japan, Israel and Lithuania, Los Angeles city officials and Sugihara's son, Chiaki Sugihara, in attendance. The memorial, entitled "Chiune Sugihara Memorial, Hero of the Holocaust" depicts a life-sized Sugihara seated on a bench, holding a visa in his hand and is accompanied by a quote from the Talmud: "He who saves one life, saves the entire world." He was posthumously awarded the Commander's Cross with the Star of the Order of Polonia Restituta in 2007, and the Commander's Cross Order of Merit of the Republic of Poland by the President of Poland in 1996. Also, in 1993, he was awarded the Life Saving Cross of Lithuania. He was posthumously awarded the Sakura Award by the Japanese Canadian Cultural Centre (JCCC) in Toronto in November 2014. In June 2016, a street in Netanya, Israel, was named for Sugihara in the presence of his son Nobuki, as a number of Netanya's current residents are descendants of the Lithuanian Jews who had been given a means of escaping the Third Reich. There is also a street named Rua Cônsul Chiune Sugihara in Londrina, Brazil. Levine, Hillel (4 November 1996). In Search of Sugihara: The Elusive Japanese Diplomat Who Risked his Life to Rescue 10,000 Jews From the Holocaust. Free Press. ISBN 9780684832517. Sugihara's widow with Lithuania's then president Valdas Adamkus at a tree planting ceremony in Vilnius, Lithuania in 2001. A Japanese TV station in Japan made a documentary film about Chiune Sugihara. This film was shot in Kaunas, at the place of the former embassy of Japan. Sugihara: Conspiracy of Kindness (2000) from PBS shares details of Sugihara and his family and the fascinating relationship between the Jews and the Japanese in the 1930s and 1940s. On 11 October 2005, Yomiuri TV (Osaka) aired a two-hour-long drama entitled Visas for Life about Sugihara, based on his wife's book. Chris Tashima and Chris Donahue made a film about Sugihara in 1997, Visas and Virtue, which won the Academy Award for Live Action Short Film. A 2002 children's picture book, Passage to Freedom: The Sugihara Story, by Ken Mochizuki and illustrated by Dom Lee[permanent dead link], is written from the perspective of Sugihara's young sons and in the voice of Hiroki Sugihara (age 5, at the time). The book also includes an afterword written by Hiroki Sugihara. In 2015, Japanese fictional drama film Persona Non Grata (杉原千畝 スギハラチウネ) was produced, Toshiaki Karasawa played Sugihara. Leaders and students of the Mir Yeshiva, Yeshivas Tomchei Temimim (formally of Lubavitch/Lyubavichi, Russia) relocated to Otwock, Poland and elsewhere. Yaakov Banai, commander of the Lehi movement's combat unit and later an Israeli military commander. Joseph R. Fiszman, a noted scholar and Professor Emeritus of Political Science at the University of Oregon. Robert Lewin, a Polish art dealer and philanthropist. Leo Melamed, financier, head of the Chicago Mercantile Exchange (CME), and pioneer of financial futures. John G. Stoessinger, professor of diplomacy at the University of San Diego. Zerach Warhaftig, an Israeli lawyer and politician, and a signatory of Israel's Declaration of Independence. ^ a b c d e f Tenembaum B. "Sempo "Chiune" Sugihara, Japanese Savior". The International Raoul Wallenberg Foundation. Retrieved 3 April 2011. ^ "Japan's Abe seeks Baltic support against North Korea". AFP. 14 January 2018. Retrieved 14 January 2018. ^ a b c d Yukiko Sugihara (1995). Visas for life. Edu-Comm Plus. ISBN 978-0-9649674-0-3. ^ Pulvers, Roger (11 July 2015). "Chiune Sugihara: man of conscience". The Japan Times Online. ISSN 0447-5763. Retrieved 4 August 2017. ^ Levine, Hillel (4 November 1996). In Search of Sugihara: The Elusive Japanese Diplomat Who Risked his Life to Rescue 10,000 Jews From the Holocaust. Free Press. p. 69. ISBN 9780684832517. ^ a b Sugihara, Seishiro. Chiune Sugihara and Japan's Foreign Ministry, between Incompetence and Culpability. Lanham, Md. : University Press of America, 2001. ^ "Polish-Japanese Secret Cooperation During World War II: Sugihara Chiune and Polish Intelligence". Asiatic Society of Japan. March 1995. Archived from the original on 16 July 2011. Retrieved 3 April 2011. ^ Cassedy, Ellen. "We Are Here: Facing History In Lithuania." Bridges: A Jewish Feminist Journal 12, no. 2 (2007): 77–85. ^ Wolpe, David. "The Japanese Man Who Saved 6,000 Jews With His Handwriting." New York Times. 15 October 2018. 15 October 2018. ^ Sakamoto, Pamela Rotner (1998). Japanese diplomats and Jewish refugees: a World War II dilemma. New York: Praeger. ISBN 978-0-275-96199-2. ^ Warhaftig, Zorach (1988). Refugee and Survivor: Rescue Efforts during the Holocaust. Yad Vashem. ISBN 9789653080058. ^ ushmm "Polish Jews in Lithuania:Escape to Japan"
^ Aleksandra Hądzelek (University of Technology Sydney, Australia) (2016). "The memory of Sugihara and the "visas for life" in Poland" (PDF). rcin.org.pl. ^ a b c Levine, Hillel (1996). In search of Sugihara: the elusive Japanese diplomat who risked his life to rescue 10,000 Jews from the Holocaust. New York: Free Press. ISBN 978-0-684-83251-7. ^ "The Asiatic Society of Japan". ^ a b Lee, Dom; Mochizuki, Ken (2003). Passage to Freedom: The Sugihara Story. New York: Lee & Low Books. ISBN 978-1-58430-157-8. ^ Levine, Hillel (1996). In search of Sugihara: the elusive Japanese diplomat who risked his life to rescue 10,000 Jews from the Holocaust. New York: Free Press. ^ Fogel, Joshua A. "The Recent Boom in Shanghai Studies." Journal of the History of Ideas 71, no. 2 (2010): 313–33. ^ "Port of Humanity Tsuruga Museum". Tmo-tsuruga.com. Retrieved 29 October 2016. ^ "Sugihara House Museum". Archived from the original on 5 February 2011. Retrieved 3 April 2011. ^ "Inside Our Walls". Retrieved 3 April 2011. ^ Velazco, Ramon G. "Chiune Sugihara Memorial, Hero of the Holocaust, Little Tokyo, Los Angeles". Retrieved 3 April 2011. ^ "2007 Order of Polonia Restituta" (PDF). Retrieved 3 April 2011. ^ "1996 Order of Merit of the Republic of Poland" (PDF). Retrieved 3 April 2011. ^ "Israel names street after diplomat Sugihara, who issued 'visas for life' to Jews during WWII". japantimes.co.jp. The Japan Times. 8 June 2016. Retrieved 8 June 2016. A ceremony on a planned street named after the late Japanese diplomat Chiune Sugihara was held in Netanya, Israel, on Tuesday. Sugihara issued transit visas to thousands of Jews people during World War II, which later came to be known as "visas for life," as they saved many from Nazi persecution. Netanya is known as a place where many Jews arrived after fleeing from the oppression thanks to visas issued by Sugihara. The plan to build the street marks 30 years since Sugihara's death. "It's such an honor. I wish my father was here," said Sugihara's fourth son, Nobuki, 67. ^ "Sugihara: Conspiracy of Kindness | PBS". Retrieved 3 April 2011. ^ "Visas that Saved Lives, The Story of Chiune Sugihara (Holocaust Film Drama)". Retrieved 3 April 2011. ^ "Visas and Virtue (2001) – IMDb". Retrieved 3 April 2011. ^ Fiszman, Rachele. "In Memoriam." PS: Political Science and Politics 33, no. 3 (2000): 659–60. Ganor, Solly (2003). Light One Candle: A Survivor's Tale from Lithuania to Jerusalem. Kodansha America. ISBN 978-1-56836-352-3. Gold, Alison Leslie (2000). A Special Fate: Chiune Sugihara: Hero Of The Holocaust. New York: Scholastic. ISBN 978-0-439-25968-2. Kranzler, David (1988). Japanese, Nazis and Jews: The Jewish Refugee Community of Shanghai, 1938-1945. Ktav Pub Inc. ISBN 978-0-88125-086-2. Saul, Eric (1995). Visas for Life : The Remarkable Story of Chiune & Yukiko Sugihara and the Rescue of Thousands of Jews. San Francisco: Holocaust Oral History Project. ISBN 978-0-9648999-0-2. Iwry, Samuel (2004). To Wear the Dust of War: From Bialystok to Shanghai to the Promised Land, an Oral History (Palgrave Studies in Oral History). Basingstoke: Palgrave Macmillan. ISBN 978-1-4039-6576-9. Paldiel, Mordecai (2007). Diplomat heroes of the Holocaust. Jersey City, N.J: distrib. by Ktav Publishing House. ISBN 978-0-88125-909-4. Sakamoto, Pamela Rotner (1998). Japanese diplomats and Jewish refugees: a World War II dilemma. New York: Praeger. ISBN 978-0-275-96199-2. Staliunas, Darius; Stefan Schreiner; Leonidas Donskis; Alvydas Nikzentaitis (2004). The vanished world of Lithuanian Jews. Amsterdam: Rodopi. ISBN 978-90-420-0850-2. Steinhouse, Carl L (2004). RIGHTEOUS AND COURAGEOUS: HOW A JAPANESE DIPLOMAT SAVED THOUSANDS OF JEWS IN LITHUANIA FROM THE HOLOCAUST. Authorhouse. ISBN 978-1-4184-2079-6. J.W.M. Chapman, "Japan in Poland's Secret Neighbourhood War" in Japan Forum No.2, 1995. Ewa Pałasz-Rutkowska & Andrzej T. Romer, "Polish-Japanese co-operation during World War II " in Japan Forum No.7, 1995. Takesato Watanabe, "The Revisionist Fallacy in The Japanese Media1-Case Studies of Denial of Nazi Gas Chambers and NHK's Report on Japanese & Jews Relations"in Social Sciences Review, Doshisha University, No.59,1999. Gerhard Krebs, Die Juden und der Ferne Osten at the Wayback Machine (archived 5 November 2005), NOAG 175–176, 2004. Gerhard Krebs, "The Jewish Problem in Japanese-German Relations 1933–1945" in Bruce Reynolds (ed. ), Japan in Fascist Era, New York, 2004. Jonathan Goldstein, "The Case of Jan Zwartendijk in Lithuania, 1940" in Deffry M. Diefendorf (ed. ), New Currents in Holocaust Research, Lessons and Legacies, vol.VI, Northwestern University Press, 2004. Hideko Mitsui, "Longing for the Other : traitors’ cosmopolitanism" in Social Anthropology, Vol 18, Issue 4, November 2010, European Association of Social Anthropologists. "Lithuania at the beginning of WWII"
George Johnstone, "Japan's Sugihara came to Jews' rescue during WWII" in Investor's Business Daily, 8 December 2011. Revisiting the Sugihara Story from Holocaust Survivors and Remembrance Project: "Forget You Not"
Foreign Ministry says no disciplinary action for "Japan's Schindler"